Wikipedia says “Recursion is a method where the solution to a problem depends on the solution to smaller instances of the same problem.” What I understood is that we need to break the big problem into similar smaller pieces in order to tackle the complete problem. Divide and Rule. The base case returns a value without making any further recursive calls. This is the step which stops recursive methods to run infinitely. The reduction steps which is the main part. 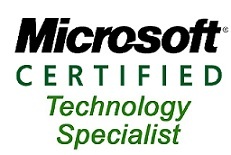 Basically, it relates the function at one or more inputs to the function evaluated at one or more inputs. At the end sequence of input parameters should reduce to base value. Let’s understand what is happening in the flow chart. 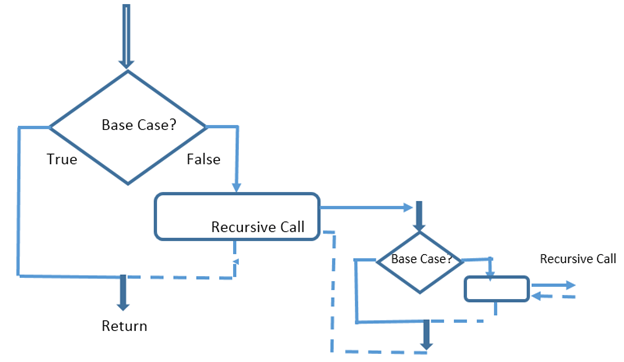 In every recursive method, there is a base case which terminates the function if the condition is satisfied else the method calls itself to return the value or it may call itself successively and the chain continues unless one of the called methods meets the required condition to terminate the chain. We will understand the above points when we will solve some real problems. Let’s find out the base case for this problem. Base Case: If the N=1 then return 1 and terminate function. Reduction step: For this problem reduction step is N*Recursive Call(N-1). For any given number N we want to multiply that number with N-1, N-2, N-3 until we reach 1. Let’s find out the factorial of 3. I guess the above flow chart is self-explanatory. We have N=3 we pass it to function, base case N==1 is false in the first case then in reduction step N is reduced by 1 i.e. 3-1=2 and it calls itself. Now we have N=2 and again the base case is false so for the reduction step N becomes 2-1=1, and function calls itself, this time, we have N=1 so the base is true and hence function terminates by returning the desired result. 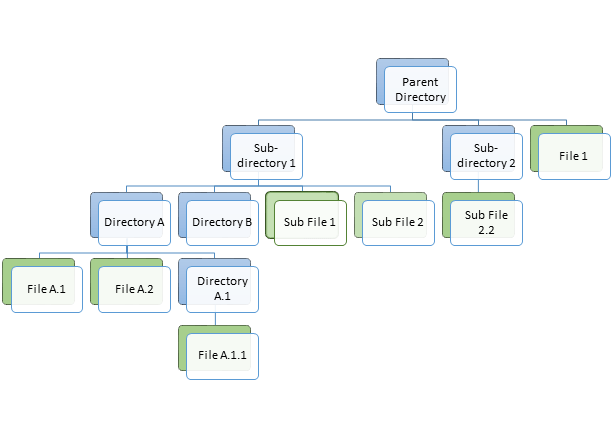 In the above tree diagram, the colour nodes represent files and blue represents subdirectories. So are we going to this problem using recursion? Firstly we will get all the files present in the parent directory and if parent directory contains sub-directories then the recursive call is made. Base case in this problem is that a directory does not contain any subdirectory. Reduction step is to pass the subdirectory name. In this problem, we have used iteration as well to get the desired result because a directory may contain more than one subdirectories and we have to get files from each subdirectory. The algorithm is very simple in here. We need to traverse a node and all its children and if a child contains its own children then we need to traverse the children also. The base case is to traverse till a node contains children and reduction step is to pass each child in recursion one by one. If we observe the object carefully we will find that the object basically contains an array of objects having two properties; one is Title and the other is an array of Nodes which may contain an array of nested objects. So the algorithm to create the list as shown above we need to traverse each object and create an ol list and add li item in it as per the number of objects. If the object contains the nested object then the same process is repeated hence recursion. The base case is until the object has nested object. Reduction step is to pass each nested in a loop. 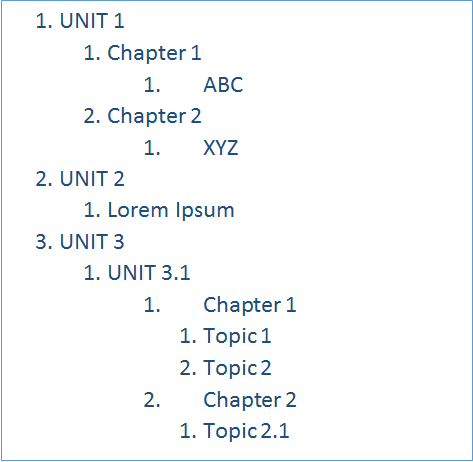 We are going to create an H-tree of order n which the base is null for n=0. The reduction step is to draw, within the unit square 3 lines in the shape of H four H-trees of n-1 order, one connected to each tip of the H in the manner that the H-trees of order n-1 is centred in the four quadrants of the square, halved in size. 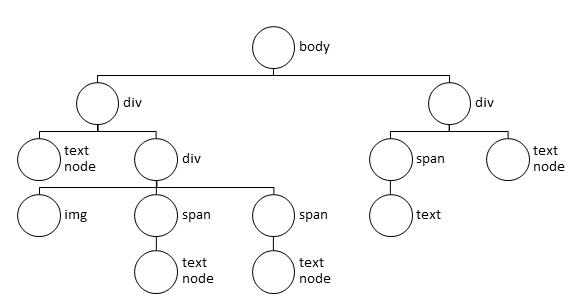 Let’s see the code to draw the above recursive graph. We leveraged the power of recursion in various situations. All we need to solve any problem with the help of recursion is to find the base case and the reduction step for given problem. A Proper algorithm needs to be created before writing any code. I hope the above examples are interesting and easy enough to help you understand the basics of recursion.